T.J. Oshie completed a hat trick in overtime to give the Washington Capitals a 4-3 victory over the Pittsburgh Penguins on Thursday night in a classic start to the highly anticipated second-round playoff series between Alex Ovechkin and Sidney Crosby. Oshie's wraparound goal 9:33 into overtime of Game 1 stood up after video review once it was definitively shown that the puck went over the goal line. Vezina Trophy finalist Braden Holtby made 42 saves, and Andre Burakovsky also scored for the Capitals. Pittsburgh's Matt Murray stopped 43 shots. Ben Lovejoy, Evgeni Malkin and Nick Bonino scored for the Penguins, who will try to even the series Saturday night in Game 2. 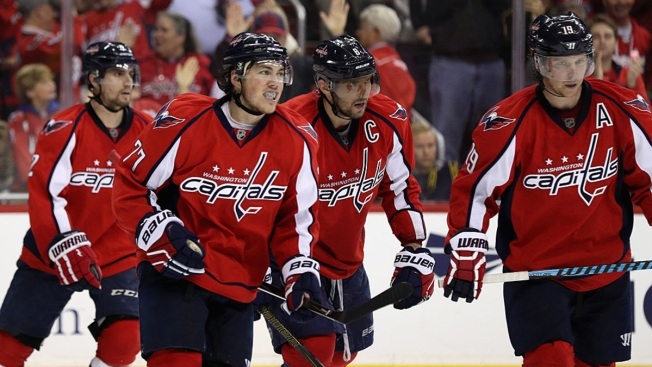 Ovechkin assisted on Oshie's second goal, while Crosby was on the ice for three goals against. This is the first playoff meeting between the 2004 and 2005 No. 1 picks since 2009. After days of hype, the Penguins jumped out to a fast start. Chris Kunitz fired a shot off the post in the first minute, and Pittsburgh had five of the game's first six shots. A tripping penalty on Pittsburgh's Matt Cullen didn't lead to a power-play goal but it turned the tide. The game was played almost entirely in the Penguins' defensive end as Washington had 10 consecutive shots on goal. The ninth and 10th in that sequence came off the rush 10:13 in and made it 1-0 Washington. With John Carlson and Jason Chimera on a 3-on-2 advantage, Burakovsky fed Chimera and scored on the rebound off Murray's left pad. Burakovsky's goal was his first point of the playoffs. It was just the start of the scoring. At 10:40 of the second period, the Penguins got their own rebound goal off the rush. Nick Bonino blew past the Capitals' third defensive pair of Nate Schmidt and Dmitry Orlov, turning them inside out and giving Lovejoy a put-back off Holtby's right pad. Just 57 seconds later, Malkin showed off his skill, stepping off the bench and taking a pass from Kunitz. Malkin strode toward the net and lifted a backhander over Holtby to give the Penguins the lead. It lasted only 33 seconds. A turnover by Pittsburgh's Olli Maatta gave Oshie a breakaway, and the Sochi Olympic shootout star fired glove side on Murray to complete the sequence of three goals in 90 seconds. Pittsburgh outshot Washington 17-7 in the second period, but 3:23 into the third the Capitals got the lead back thanks to Ovechkin and Oshie. Ovechkin set everything up with a drive down the right wing and got it to Oshie, whose soft backhander beat Murray. At 8:42 of the third period, the Penguins took advantage of a rare defensive-zone turnover by Nicklas Backstrom to tie it again. Quick passing from Phil Kessel and Carl Hagelin got it to Bonino, whose shot went in off Schmidt and in. Each team had a golden opportunity to score in the final minutes of regulation. Murray denied Ovechkin on a partial breakaway with 3:23 left, and Holtby stopped Kessel seconds later to help get the game to overtime, where Oshie was the hero. NOTES: Capitals D Brooks Orpik returned after missing the final three games of the first round with a concussion. ... Kunitz needed medical attention when he was struck by a puck while sitting on the bench early in overtime.